We are very active on our social media pages so please follow us at Facebook and Twitter where you'll find updates on our auctions and interesting comic news and pictures. 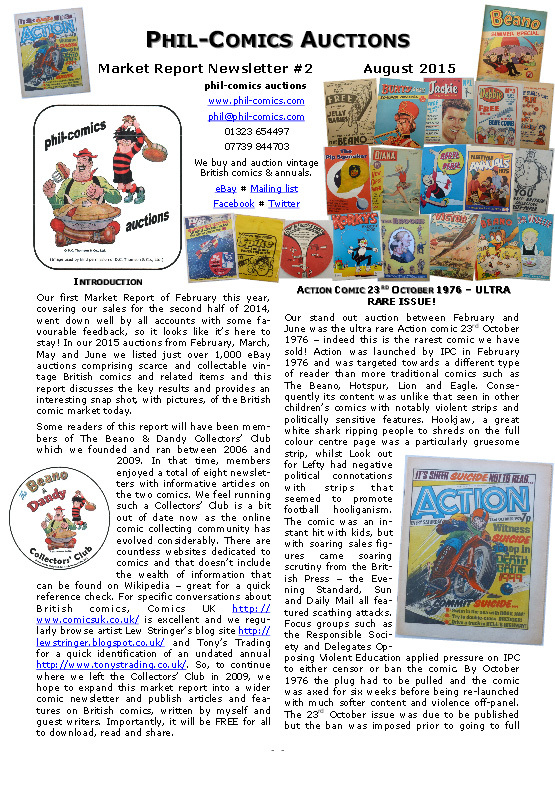 As of late 2018 we are excited to have a regular column in the monthly ComicScene magazine where we discuss the vintage comic market. 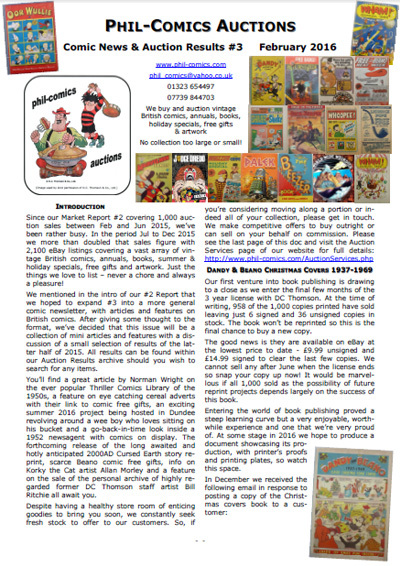 We have previously published three 'Comic News and Auction Report' newsletters that can be downloaded below by clicking the images. You'll need Adobe Reader and it may take a couple of minutes to download. The newsletters discuss some of the highlights of our auction sales and expands on certain comic titles and their characters. Several interesting features discuss the goings-on in the British comic world. Over the past few years we have been contacted many times by people who have found what they believe is an original Beano comic #1, dated 30 July 1938. In virtually every instance it has turned out to be a modern reprint and we’ve reluctantly had to burst their bubble. As a result we have put together this handy Beano comic #1 ID Guide to help distinguish an original from a reprint. 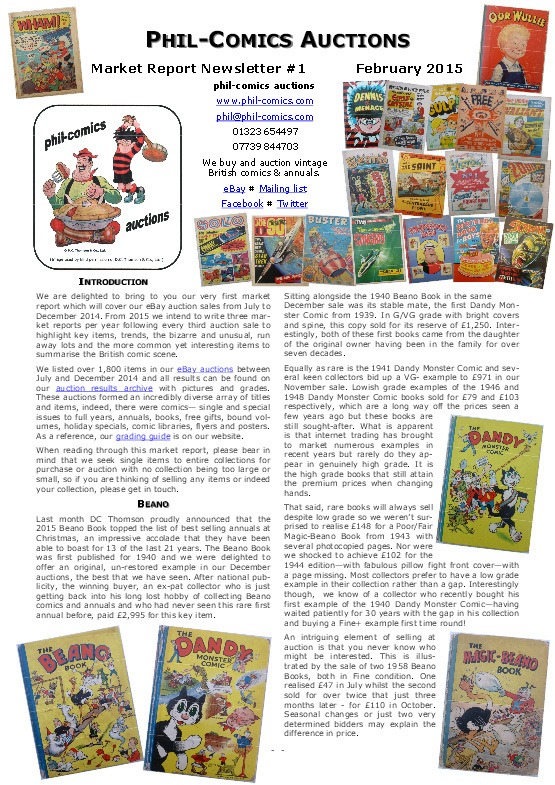 We were approached in September 2015 by freelance journalist Julian Owen who had been commissioned by The Simple Things magazine to interview a collector of Dandy and Beano annuals. Well he came to the right place as we can talk on the subject for hours and Julian's engaging writing style makes for an interesting read. A month later in October 2015 we were contacted by the editor of Scottish Memories magazine who wanted to compile an article on the nostalgia, collectable nature and value of old annuals. Again we were only too happy to oblige and an article was published in the January 2016 issue with some choice images. Purely by chance when holidaying in Sydney, Australia, in April 2015 we stumbled across a superb exhibition at the New South Wales State Library. Decades ago the Museum acquired much material from the estate of Frank Johnson Publications who produced an array of 'pulps' from comic books, humour magazines, boxing and racing fiction. On display were original artwork, comics and pulps, ephemera, letters, manuscripts and contracts in a superb exhibition called Pulp Confidential. In October and November 2015 we sold the post-1975 personal collection of former DC Thomson staff artist Bill Ritchie. Bill enjoyed an illustrious forty year career with the Dundee publishing firm spanning the 1950s to 1990s. He worked for many editors including Harold Moon, Ian Chisholm, Walter Fearn and Harold Crammond and was responsible for drawing Baby Crockett in The Beezer comic from the first appearance in #34 (Sep 1956) to #1809 (Sep 1990) inclusive, some 34 years. He also drew Toots in Bunty for some 30 years, Uncle Windbag in The Beano, Pip the Penguin and Billy Big Ears in Bimbo, The Moonsters and Barney Bulldog in Sparky, Dicky Burd and Hairy Dan the Football Fan in Beezer and much more. Although Bill's characters weren't household names like Desperate Dan, Dennis the Menace, The Bash Street Kids or Jonah, drawn by Dudley Watkins, David Law, Leo Baxendale and Ken Reid respectively, his work is very well respected in the comic art archives. After all, he was able to produce a large volume of work each week, on time, of a consistent nature and quality for his entire career. A preview of the collection can be read in our Market Report #3 and a very informative Bill Ritchie biography has been written by Peter Hansen, containing many illustrations of printed material, original artwork and never-seen-before rough sketches.